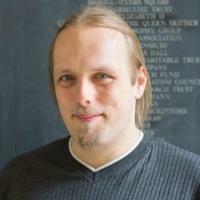 Last week I was talking to Alexander Dutton about an idea that we had to implement cookie-like behaviour using browser caching. 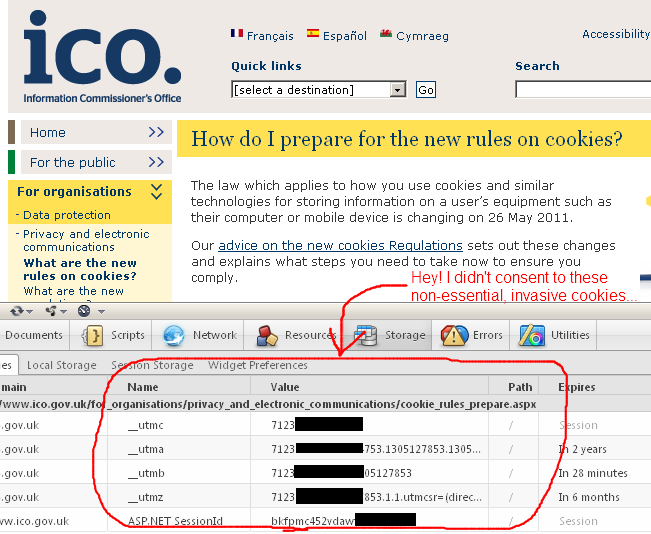 As I first mentioned last year, new laws are coming into force across Europe that will require websites to ask for your consent before they store cookies on your computer. Regardless of their necessity, these laws are badly-defined and ill thought-out, and there’s been a significant lack of information to support web managers in understanding and implementing the required changes. 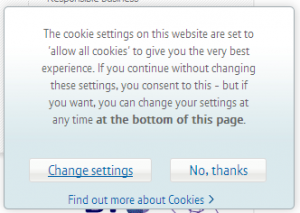 British Telecom’s implementation of the new cookie laws. Curiously, if you visit their site using the Opera web browser, it assumes that you’ve given consent, even if you click the button to not do so. To illustrate one of the ambiguities in the law, I’ve implemented a tool which tracks site visitors almost as effectively as cookies (or similar technologies such as Flash Objects or Local Storage), but which must necessarily fall into one of the larger grey areas. My tool abuses the way that “permanent” (301) HTTP redirects are cached by web browsers. A user visits the website. The server generates a random unique identifier for this user. 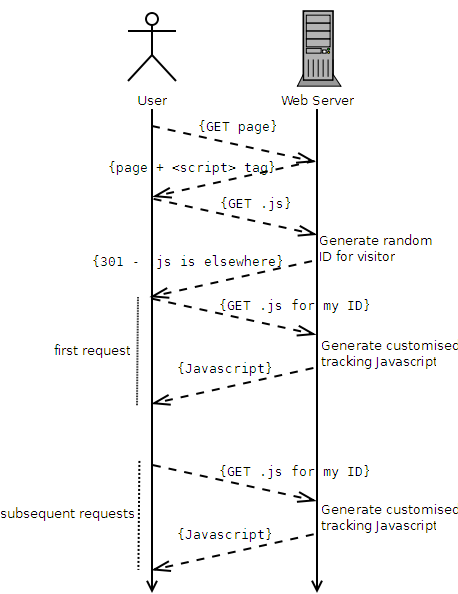 Subsequent requests to the server, even after closing the browser, skip steps 3 through 5, because the user’s browser will cache the 301 and re-use the unique web address associated with that individual user. How my “301-powered ‘cookies'” work. Is more-fragile (clearing the cache is a more-common user operation than clearing cookies, and a “force refresh” may, in some browsers, result in a new tracking ID being issued). Is less-blockable using contemporary privacy tools, including the W3C’s proposed one: it won’t be spotted by any cookie-cleaners or privacy filters that I’m aware of: it won’t penetrate incognito mode or other browser “privacy modes”, though. Moreover, this technique falls into a slight legal grey area. It would certainly be against the spirit of the law to use this technique for tracking purposes (although it would be trivial to implement even an advanced solution which “proxied” requests, using a database to associate conventional cookies with unique IDs, through to Google Analytics or a similar solution). However, it’s hard to legislate against the use of HTTP 301s, which are an even more-fundamental and required part of the web than cookies are. Also, and for the same reasons, it’s significantly harder to detect and block this technique than it is conventional tracking cookies. However, the technique is somewhat brittle and it would be necessary to put up with a reduced “cookie lifespan” if you used it for real. Note that I am not a lawyer, so I can’t make a statement about the legality (or not) of this approach to tracking. I would suspect that if you were somehow caught doing it without the consent of your users, you’d be just as guilty as if you used a conventional approach. However, it’s certainly a technically-interesting approach that might have applications in areas of legitimate tracking, too. Update: The demo site is down, but I’ve update the download code link so that it still works. Unfortunately, the Rails developers didn’t see fit to extend HTTPOnly cookies to those of us using ActiveRecordStore, where the XSS risk is still just as real. To fill this gap, I’ve produced a very simple and only slightly-hackish plugin which overrides the functionality of Rails’ CGI::Cookie to force all cookies produced by Rails to be HTTPOnly, regardless of the session store being used. To use it, download this file and exract it into your application’s vendor/plugins directory, and restart your application server. You can test that it’s working using Tamper Data, FireCookie, or whatever your favourite cookie sniffing tool is.